Chard Stalks with Saffron – Dig Delve – An online magazine about gardens, landscape, growing & making. Nearly all of the vegetable beds in the kitchen garden are now empty of last year’s crops and are gradually being refilled with this year’s. The autumn sown broad beans are 3 feet high, the peas, sown just over a month ago, are twining around their supports, and the first seedlings of lettuce, beetroot and carrot are finally getting away after the long dry spring. The very last of the old veg to come out is the chard. Sown this time last year, eight plants (four of white-stalked Swiss chard and four of the crimson-stemmed ruby chard) have stood all winter, providing some variety of greens amongst the cabbages. For the past three months, the young leaves have been the foundation of our first salads, while the older ones have found their way into a number of chard tarts. You rarely see Swiss chard in farmer’s markets, and I have never encountered it on a restaurant menu. This is most likely due to the fact that the large fleshy leaves quickly wilt after cutting, giving it an unappealing appearance for sale. Freshly cut, however, they are shiny and juicy and squeak with health as you gather and prepare them. We rarely grow spinach as we have had trouble with even the bolt-resistant varieties. For the amount of time and effort expended in sowing, tending and harvesting, the resulting meagre handfuls we have been able to gather before they go to seed reduce to nothing in the pan and so are hardly worth growing. Chard is far less temperamental and has a much longer growing season. Although they don’t have as high a concentration of oxalic acid as spinach, and which gives these leafy greens their distinctive ‘dry’ taste in the mouth, I use chard leaves to replace spinach in any recipe that calls for it, and prefer the sweeter, mellower flavour. 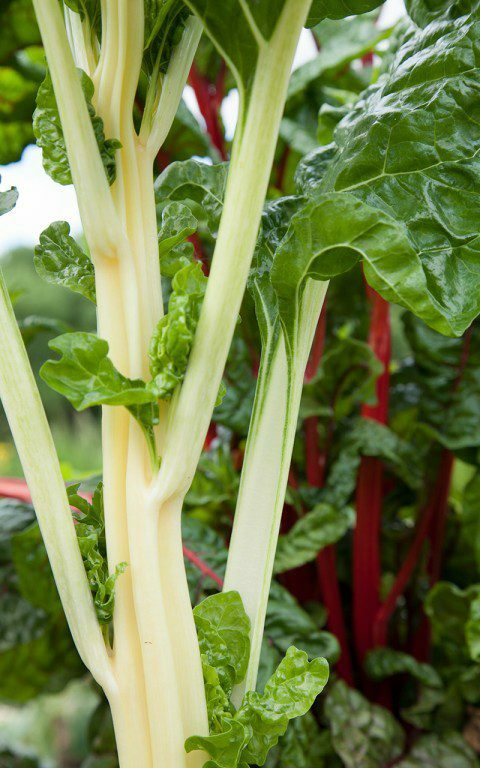 Chard also has the added benefit of its thick edible stalks, or ribs, for which, in France, they are primarily grown and considered a great delicacy on a par with white asparagus. 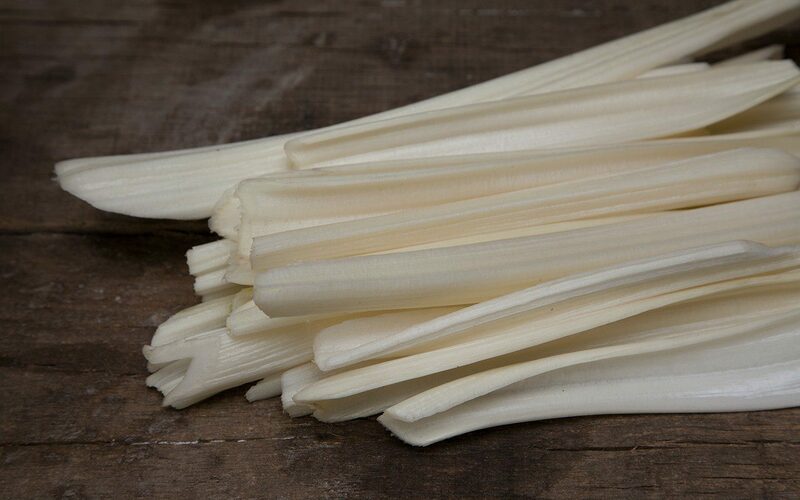 A completely separate vegetable from the leaf, they are most similar in texture to sea kale and can be used in any recipe that calls either for that uncommon vegetable, white asparagus, cardoons or celery. 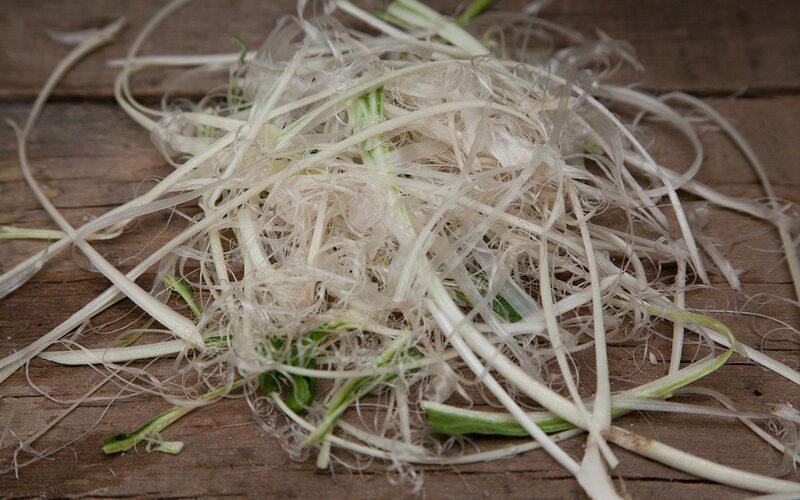 As you would with cardoons or celery, the stalks must be de-stringed before use, or you will find yourself with an unpalatable, unswallowable mouthful of fibre. 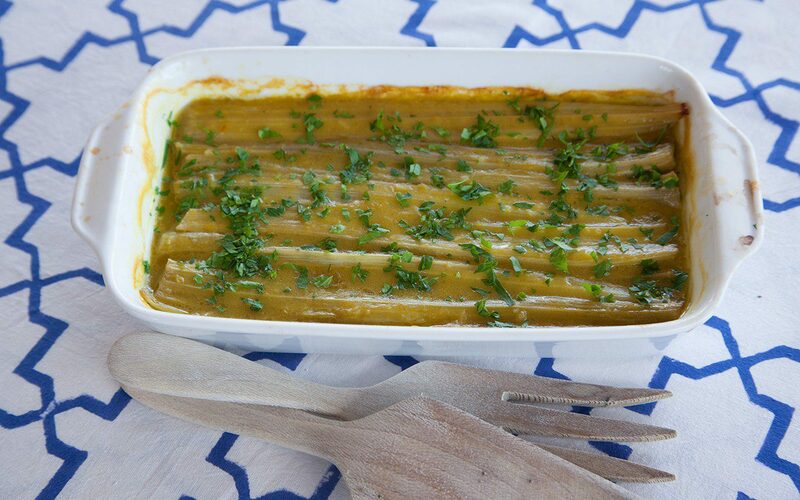 In France it is common to make a gratin of the blanched stalks covered with either a béchamel sauce or, in the south, one made of tomatoes, onion, garlic and olives. The quickest way to prepare them is to cut them into pieces, blanch them for a few minutes, drain and then transfer to a pan in which you have stewed some onion and garlic in olive oil. Leave to cook together, covered, for a few minutes more, then season and serve dressed with lemon juice and chopped parsley. Sometimes, though, I want to elevate this seemingly mundane ingredient into a dish over which a little more care is taken, and this very slightly adapted recipe from Richard Olney’s Simple French Food, is one I often make. It is incredibly simple, but cooking the stalks in an aromatic court bouillon before combining them with a richly-flavoured, slow-cooked sauce, creates a layering of flavours that causes the vegetable to undergo an almost alchemical transformation during cooking into something that is more than the sum of its parts. Garlic, anchovy and saffron are much-used ingredients in Provence, where Olney lived and learnt much of his art for French country cooking from Lulu Peyraud, and the taste of this dish is reminiscent of rouille, the saffron and garlic sauce that accompanies bouillabaisse. So, as a side dish, it is a natural pairing with fish. When serving as a main course I might scatter over a handful of oiled breadcrumbs and some grated Gruyère for the last 10 minutes of cooking, and, as Richard Olney himself recommends, serve with a simple pilaf of onion and tomato. Put all of the ingredients for the court bouillon into a saucepan and bring slowly to the boil, then simmer gently for half an hour with the lid on. Strain the liquid, discarding the solids, and return it to the cleaned pan. Bring back to the boil, put in the chard ribs and cook until tender – 10 minutes or a little longer. Remove the ribs with a slotted spoon, allow excess liquid to drain, then transfer them to the gratin dish. Turn the oven to 230°C. 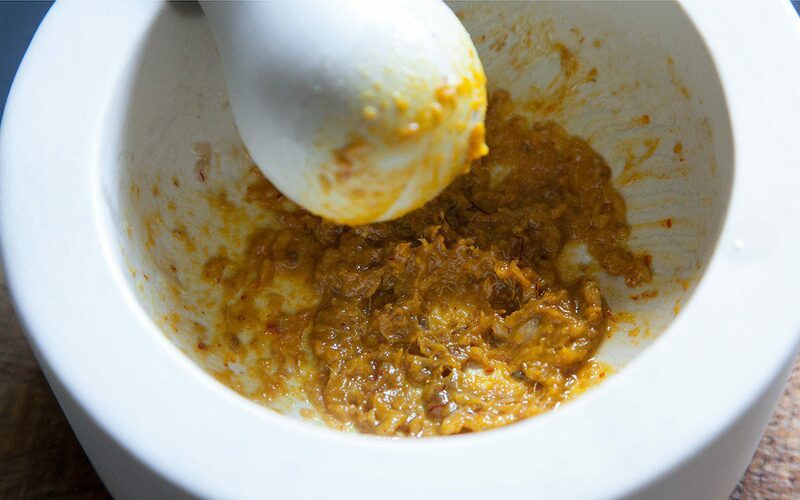 In a mortar pound together the anchovy, garlic, cayenne and saffron threads until you have a fairly smooth, golden paste. Make the roux by stirring the flour into the olive oil in a small pan, and then cook on a low heat for two minutes, stirring all the time. Add the anchovy, garlic and saffron paste and, still stirring, cook for half a minute more. Off the heat add a couple of spoonfuls of the court bouillon and stir well until smooth. Add the remainder of the court bouillon, stir and return to the heat. Stir continuously until the sauce comes to the boil and begins to thicken. The sauce should be quite thin, so don’t expect it to thicken much. Then leave to simmer on the lowest heat for about 20 minutes. Skim off the skin that forms on the surface as the sauce reduces by about a quarter. It should have the consistency of single cream. Taste and season with salt, no pepper. Pour the sauce over the chard ribs and put into the oven for 20–30 minutes until bubbling and golden brown at the edges. Scatter the parsley over the top and serve.